Want to save money by purchasing the entire unit?!? 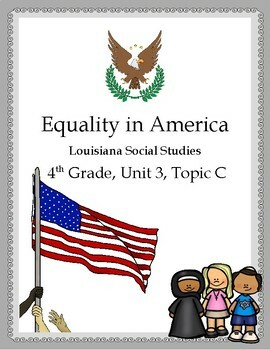 Click here: Louisiana 4th Grade, Unit 3, Full Unit! The recent shifts in social studies require students to use a set of sources and what they have learned in social studies to answer questions that look nothing like “traditional” elementary social studies tests. The rigor has increased, and students are expected to analyze sources, make inferences based on prior knowledge, and explain their reasoning. Also included in this set is a suggested pacing guide. Directions for using each of the resources are included – sometimes with pictures! Management, engagement, and organization tips are sprinkled throughout the resources as well. There is a lot of information here, so be sure to read through everything ahead of time. If you have any questions, please feel free to contact me! Answer keys are included with this set!